Now a Health Care Practitioner or Health Professional can achieve balancing topically rather than using acupuncture needles or other devices. How is it better than metal needles? In 1990, Developmental Natural Resources, Inc. (DNR, Inc.), a family owned health research firm based in Indianapolis, Indiana, created a mineral base solution with electrically charged holding combination of coded signals that could be recognized by the body. Simply put, these signals were established to send coded impulses or messages to the body. The finished product derived from this new technology has become known as "Liquid Needle." After only 7 years, there were more people in the United States depending on Liquid Needle for balancing and unblocking energy than from acupuncture needles. There are over 100 different products being formulated under the Liquid Needle name. The name is protected under U.S. federal trademark laws. The intense electronic charge given off by Liquid Needle formulas are strong enough to trigger a balancing point without being uncomfortably felt by the recipients. Finding the exact point is not required with these formulas since there is a 1 to 2 cubic inch variance for location accuracy. More importantly, there is no insertion, twirling or angling required. Of course children and many adults who object to needle insertion find the transdermal application of Liquid Needle to be fast acting, safe and painless. Liquid Needle and Liquid Signals can be used by the client as easily as used by the Health Care Professional. Liquid Needle Rebalancer formulas go far beyond the normal aspects of acupuncture. 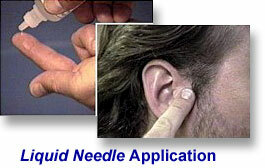 Liquid Needle products are capable of transmitting useful signals to the body while triggering specific points. These products can be used topically.. Liquid Needle Body Soaks are the cornerstone of the entire product line. While they have the capacity to balance the entire body at once, they also encourage a swift safe toxin cleansing. Click here for DNR's Liquid Needle Topicals. Click here for DNR's Liquid Needle Body Soaks.